Bulletin boards are a topic I have no patience for. You might recall that last week I ranted about dioramas. The case of dioramas pales beside my feelings about bulletin boards. Reader, beware. In the December 28–January 10 issue of New York Magazine (one of the best-written magazines anywhere, in case you wanted my opinion), I was reading with interest Andrew Rice’s excellent piece on New York City’s mayor: “How Are You Enjoying the de Blasio Revolution?” Since taking office, Mayor Bill de Blasio has been making a fair number of moves on the public education front—at least some of which seem to be successful, perhaps most notably his impressively speedy implementation of universal pre-K.
One thing de Blasio did, as any incoming mayor would do, was appoint a new chancellor to lead the public schools. His choice was Carmen Fariña, a former New York City Department of Education teacher, principal, district superintendent, and deputy chancellor. She seemed like a reasonable choice. Like it or not, I cannot blame Fariña for the bulletin board fixation—though I can and do blame her for not ending it. When we opened our Early College high school in New York City in 2009, we were subject to the administrative system then in place that called for district superintendents to lead a relatively intensive site visit of individual schools to judge each school’s strengths and weaknesses. During the site visit, many constituents were interviewed—students, parents, college staff at our cooperating City University campus, business partners on our Advisory Board, and more—and classrooms were observed. All of which seemed reasonable to me. But one major directive in getting prepared for these site visits was always about our bulletin boards. Now, let me say again that we were a high school. And we were an Early College school (we sent our kids to college classes after two years with us, and we graduated them after just three years with us). And we were a career and technical education school, with an active Advisory Board of business and industry and higher education representatives. We were all about college and careers—even before that became today’s popular mantra. Some of my colleagues and I truly felt that bulletin boards with kids’ work on them seemed out of place in our school culture. To our credit, our hallways were decorated with very large college banners. Some bulletin boards had college information on them. One was dedicated to our Advisory Board and the businesses they represented. One was dedicated to our career-related after-school engineering clubs. We thought these were fine. We just didn’t see the point of putting kids’ essays from English class, for example, on a bulletin board—like bulletin boards you might see in an elementary school. We were the first Early College career and technical education high school in New York City. We were a demonstration school for the State of New York. As such, we had lots of important visitors. Colleges don’t have student work on bulletin boards in their hallways, we argued. Corporations don’t have bulletin boards of employees’ work in their hallways, we continued. We got nowhere. I think the idea that bulletin boards—in school hallways and even in school classrooms—should have students’ work on them might work for an elementary school, but has no place in a high school and probably no place in a middle school, either. My guess is that teenagers find that practice a bit childish. But why not ask them? I won’t end with my usual advice to go ask the school board whether there is a policy on bulletin board displays in your district—though I can imagine there should be one and would even like to write a good one, if any school board is interested. Instead, talk to your principal about the bulletin boards in your child’s school. Are they appropriate for the school level—elementary, middle, or high school? Are they interesting for students and for visitors? What would students like to see on bulletin boards? I bet they have an idea—and I bet it is better than Fariña’s. Author pcrw_msPosted on January 19, 2016 Categories UncategorizedTags Andrew Rice, Bill de Blasio, bulletin boards, Bulletin Boards—Really?, Carmen Fariña, New York City Department of Education, New York MagazineLeave a comment on Bulletin Boards—Really? Welcome to the How To Find the Right College Blog Tour! 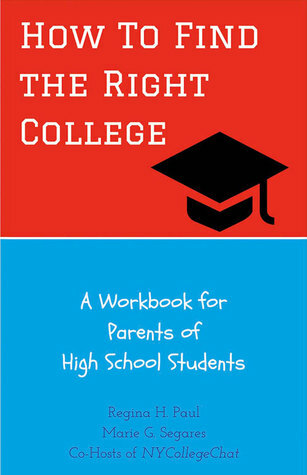 Marie Segares and I are now embarking on a blog tour for the book that we co-authored this past summer—How To Find the Right College: A Workbook for Parents of High School Students. As I hope you all already know, the book is a readable, easy-to-use guide for parents who are not as familiar with the wide range of college options as they need to be in order to help their teenager find a college that is a good fit. The book grew out of the free weekly podcast—NYCollegeChat—that we have been doing since last September. After working in the world of K–12 and higher education for a combined total of more than 50 years, we still learn new things every time we prepare for an episode. Our goal is to help parents who don’t have our 50 years of experience. Now, I have never done a blog tour, so I am not entirely sure what to expect. I hope it will give us a chance to reach parents who might not otherwise have heard about our book and our podcast. I hope it will help parents make better—even life-changing—decisions with their teenagers. Author pcrw_msPosted on November 2, 2015 November 25, 2015 Categories UncategorizedTags blog tour, college readiness, How To Find the Right College: A Workbook for Parents of High School Students, Marie Segares, Mission: Authors Talk About It, NYCollegeChat, Parents' Guide to the College Puzzle, Paying For College 101 Facebook group, Road2College, The College Money Maze, The Staten Island Family, Together with Family, Underground Crafter, Viva Fifty2 Comments on Welcome to the How To Find the Right College Blog Tour!